Time for Gold to Break 1200? December gold has struggled to maintain any kind of follow through to the breakout of 1250 and above. If we look at gold from a technical perspective to start, it’s clear that it’s broken, and likely to retest 1200 and possible contract lows over the coming weeks. December gold spent the better portion of the last three months between 1180 and 1225. In my opinion, it’s likely that gold remains range bound for the coming weeks. If you look at the ADX it’s a very weak trending market, which leads one to believe that any move up or down is not likely to have much follow through. Gold is currently trading sharply lower, down $14 on the session following the FOMC meeting that essentially stated that a continued hawkish stance and gradual rate hikes are necessary to keep up with the inflation goal. There are other key factors leading to gold's decline. First and foremost, the U.S. dollar index continues to pummel emerging market currencies, and pressure gold from any follow through rally. Another key reason for the sell-off is the U.S. unemployment claims data that came out this week which showed a 45-year low in claims. This is obviously great news for the economy and a headwind for the safe haven commodity. There are a number of ways to engage gold in this range in which a trader can take a non-directional stance using options and futures, and even a combination of the two for a trade. With the recovery in the U.S. equities and the dollar index staging a rally this week, silver has experienced a slow break with prices stuck in a trading range of 14.25 to 14.80 for the December futures. The FOMC minutes report, which showed no change in U.S. monetary policy, also created no significant price reaction after the report. The FOMC statement said to expect an additional amount of incremental rate hikes coming down the road. Silver prices are expected to see a recovery in 2019 due to demand from the technology sector, and have a long-term bullish outlook in the automobile industry due to the shift in the hybrid electric vehicle space. With the gold/silver ratio still near its all-time high, some believe silver is going to surprise with its performance to the upside. There is a current short speculative position in silver in the Commitment of Traders report. We will have to monitor open interest levels to see how price action dictates people getting out of their positions if silver prices indeed start to rally. Silver’s implied volatility is trading at 16 percent, with the futures trading at approximately 14.25 and the money straddle is being valued at about .42 cents. Being stuck in this trading range, we have support at 14.20 and resistance at 14.60. It is hard to see anything significant for silver until we break out of these ranges. 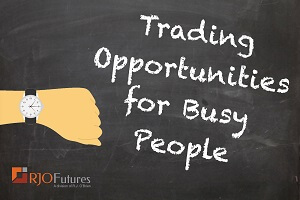 If you have any questions or would like to discuss the markets further, please feel free to contact me at 800-438-4805 or tbeller@rjofutures.com. These fundamental factors are seen technically below with the market taking out the 200 and 100 day moving averages and an oversold level on the RSI. Looking ahead and to outside markets in the energy complex, weather could play a factor, should there be continued forecasts for cold weather, similar to the price action seen lately in the natural gas market. There are also a number of factors to monitor such as gasoline demand and inventories, crack spreads, a slight uptick in the latest refinery utilization rate and a number of fundamental factors for distillates such as heating oil. Also on the horizon is the December meeting for OPEC+ and their corresponding decision for 2019 production and the possibility of a 2019 production curb quota. Late last week natural gas gapped open almost .18 cents per bcf, but since then it has been trading sideways more than anything. The 3.500 handle is well above last month’s trading range and congestion. You may see Natural gas try to close the gap over the next few trading days, but caution should be exercised because of the cold weather that has been forecast over the coming weeks. Support is around 3.440. Momentum studies are still trending higher, but should start to roll over if the current pattern remains intact. Increased daily production keeps the bull camp in check. Daily and yearly increases in production are keeping a lid on prices. Today’s injection is expected at 56 bcf, which is more than the 5yr average of 48. A move down to fill the gap would not surprise me. The market should continue to move sideways to lower if really cold weather does not move in. It seems this year went from summer to winter, but what will happen when the temperature really gets bad? A day after the U.S. midterm elections, equities rallied and commodities had a mixed tone. Softs traded mainly off their own fundamentals and technicals. The pound moved higher as the dollar weakened. The demand outlook for cocoa continued to gain strength as supply news in cocoa also continued to support the market. West Africa is showing lower production outputs while increasing demand data. Cameroon cocoa production and exporting could be affected in the short-term due to unrest and safety issues that their government has had to intervene in. This news could also provide additional support and help the futures push above 2400. Technically, the market is overbought, but if the fundamentals continue to be the front story, look for new highs to be made. The roll to March could also give us some direction if longs stay in the market. A break above the 200-day moving average will also be a bullish indicator. After such a major rally over the past month, it would appear natural for the market to meet resistance, and ultimately correcting as it should. A large supply still awaits next season and we’ve also seen some weakness in the Brazilian currency, but strength in the equities market may help coffee prices hold support at these levels. Technically, it appears that December coffee prices may be forming a bullish pennant continuation pattern to the upside. A break at the apex of the pattern (approx. 116 level) may push coffee prices quickly above the 200-day MA, for a run back to the 125 level. This pattern will likely continue to formulate over through the balance of November, with the apex of the pattern plotted to be reached in the beginning of December. Likewise, a break down at the apex could send coffee prices back down to the 110 level in a massive hurry. The dollar is showing some strength early on this morning, but until the December contract breaks above 9628, the strength will not negate the downward bias that's been plaguing it since the last trading day of October. However, don’t be surprised to see the Fed meeting lift the dollar this morning. On the contrary, expectations for ongoing claims to show minimal change, fails to add new economic hope from yesterday. Support comes in at 9555 and 9512, with resistance at 9634 and 9671. The Euro is trading lower today and this is probably the result of the overdone compacted rally yesterday and the currency is probably held back as a result of a narrowing of the German trade surplus. While the markets were once again presented with ideas that the exit might be possible soon, the trade has basically become immune to such delays. Support is seen at 114.1500 and resistance is at 115.3000. U.S. government bond prices moved slightly higher Wednesday following U.S. midterm election results. Yields on the 10-year briefly matched its yearly high of 3.248% on the idea that continued Republican control of the House would improve the chances of more tax cuts as well as increases in spending. This comes amid a near monthly high in the 10-year yield on Friday following reports that 250,000 jobs were added in October and that average hourly wages rose the most in almost a decade. Average hourly earnings rose 3.1% year over year and unemployment remained at 3.7%. Incoming data will continue to provide signals as to whether the labor market is tightening, which would generate wage inflation and support the Fed’s initiative to gradual raise interest rates through 2019. Moreover, it will be important continue to monitor energy prices, specifically oil, which if continues to slide, will deflate inflation expectations and increase interest in long term treasury markets. The Treasury is expected to issue nearly $1 trillion in debt this year, which would be the most since 2010. This increase in supply as well as the hawkish Fed have been observed as contributors to the rise in yields. Although the Fed is not expected to raise rates at the conclusion of the two-day policy meeting on Thursday, attention will be on the language surrounding further rate hikes. Near term support for the December bonds comes in at 136 -30 with the next upside target around 138 – 24. The indices are extending the sell-off that began yesterday (The min Dow was able to close positive by 2 ticks, but was off the highs by 84). The Dow remains the strongest of the bunch again, but that isn’t saying a whole lot considering it is down 160 (0.6%). We’ve seen quite a rally since bottoming out two weeks ago, so it isn’t necessarily surprising to see a bit of profit taking ahead of the weekend, with stocks also showing some overbought readings. Yesterday’s FOMC announcement went as expected, and rates were left unchanged. As of now, we are expecting to see another quarter point hike when they get together again in December. Both PPI and consumer sentiment came in above expectations, and the remainder of the day holds little by way of economic data. Most markets will have regular electronic trading hours on Monday, but there will be some pit closures in observance of Veterans Day.